Great phytoplankton blooms tend to occur at intersections: between land and sea, between different ocean currents, and between seasons. All three may have been at work near South Africa in the first half of November 2018. The Moderate Resolution Imaging Spectroradiometer (MODIS) on NASA’s Aqua satellite acquired this natural-color image on November 14, 2018. 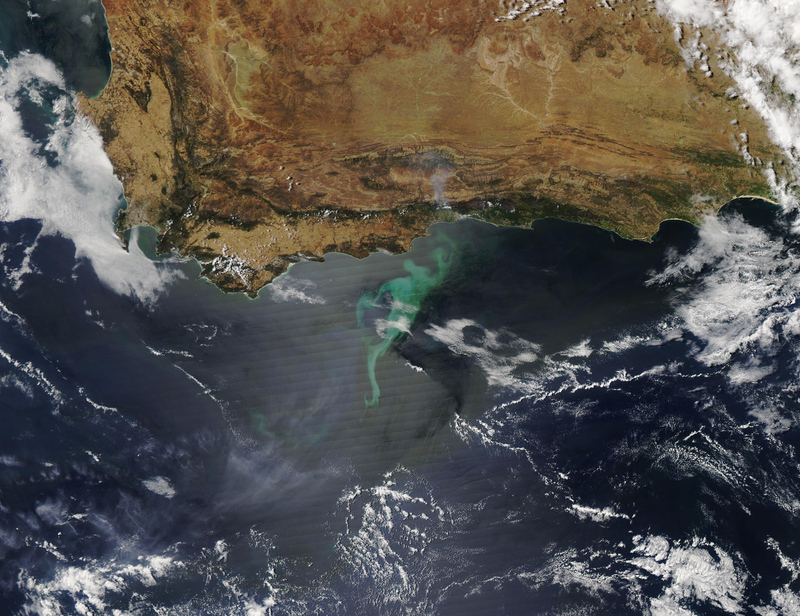 It shows a bloom of phytoplankton off the south coast of South Africa. The bloom first became visible on November 9 and was still underway on November 16. 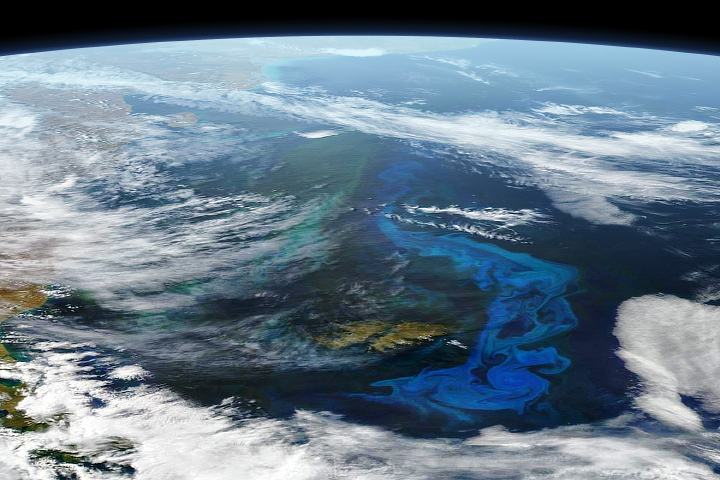 Phytoplankton are tiny, floating, plant-like cells that turn sunlight into food. They are responsible for nearly half of Earth’s primary production—that is, they transform carbon dioxide, sunlight, and nutrients into organic matter. They are the center of the ocean food web, the primary nourishment that fuels life in the sea. The amount and location of phytoplankton affects the abundance and diversity of everything from finfish to shellfish and zooplankton to whales. Like land-based plants, phytoplankton require sunlight, water, and nutrients to grow. As the Southern Hemisphere progresses through spring into summer, sunlight is becoming more abundant. Spring and autumn also tend to be times of turbulent winds and changeable weather in both hemispheres, so it is possible the South African bloom was provoked by seasonal winds that stirred up nutrients from coastal waters or through upwelling from the seafloor. The waters off of southern Africa are also notoriously turbulent and well-mixed, as two great ocean currents meet in the area. Warm water arrives from the Indian Ocean on the fast-moving Agulhas Current, which flows along the east coast of Africa. 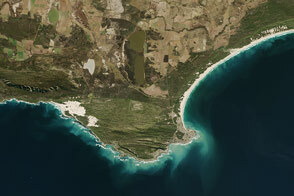 The cooler, slower Benguela Current flows north along Africa’s southwestern coast. Converging off of South Africa, the currents often generate eddies, rogue waves, and other stirring motions that mix the layers of the ocean and bring nutrients up to the surface. 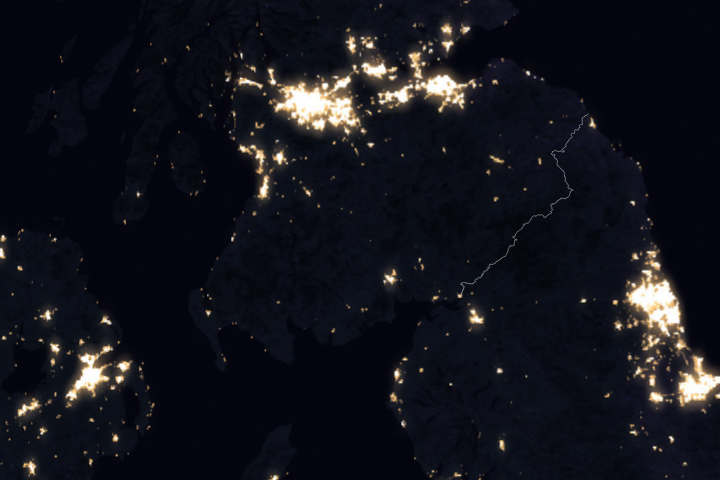 Finally, there could be one other stimulus for the current bloom, though the idea is mostly speculation. In the past few weeks, wildfires have burned along the Garden Route near the South African coast, and the smoke was blown seaward on many occasions. Smoky winds can carry ash, dust, metals, and other aerosols and pollutants out over the ocean, where they call fall onto the sea surface. 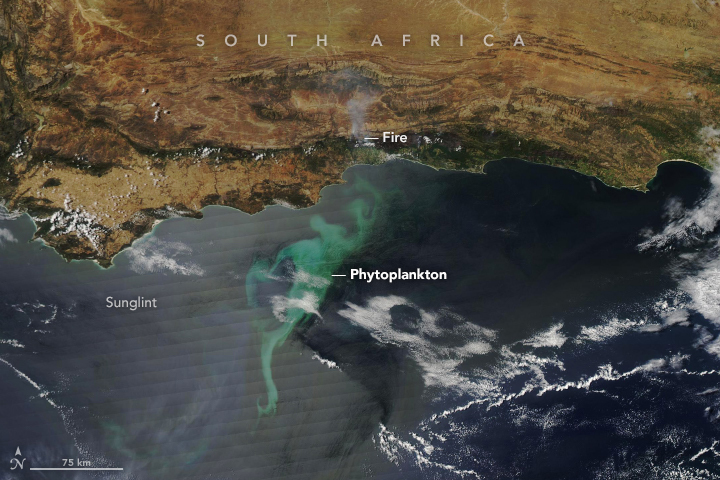 Researchers know from other studies that airborne dust and volcanic ash can provide nutrients to provoke phytoplankton blooms, but it is not clear whether airborne particles from a fire could do the same. 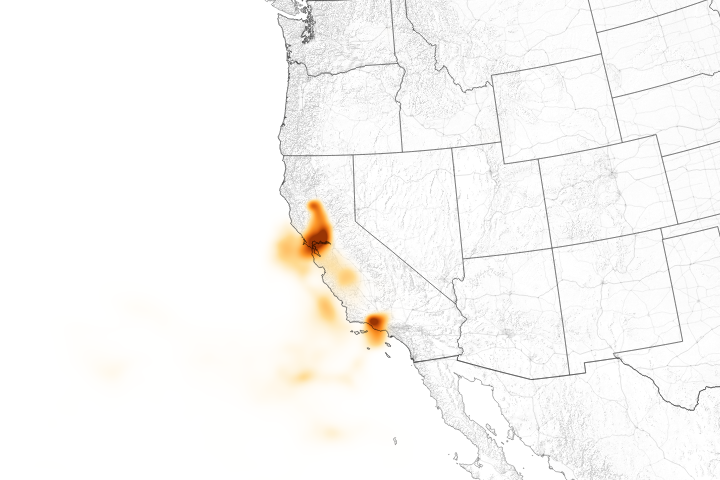 In 2017, researchers made an impromptu attempt to investigate the impact of California wildfires on the Pacific Ocean. NASA Earth Observatory image by Lauren Dauphin, using MODIS data from NASA EOSDIS/LANCE and GIBS/Worldview. Story by Michael Carlowicz. 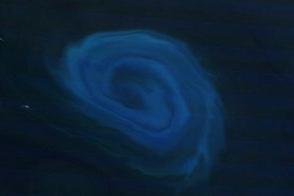 Large phytoplankton blooms tend to occur at intersections: between land and sea, between different ocean currents, and between seasons. Lutjeharms, J. (2007) Three decades of research on the greater Agulhas Current. Ocean Science, 3 (1), 129-147. NASA Earth Observatory (2017, January 27) The Treacherous and Productive Seas of Southern Africa. NASA Earth Observatory (2012, February 11) The Eddy and the Plankton. NASA Earth Observatory (1999, July 23) Agulhas Current, South Africa. Oceans Deeply (2018, January 19) Sampling the Sea During California’s Apocalyptic Wildfires. Accessed November 16, 2018. South African Data Center for Oceanography (date unknown) Agulhas Currents. Accessed November 16, 2018. University of Miami (2013) The Agulhas Current. Accessed November 16, 2018.